The fort is one of the oldest historic sites in the State. Bellary Fort is a major tourist attraction in the Bellary district. 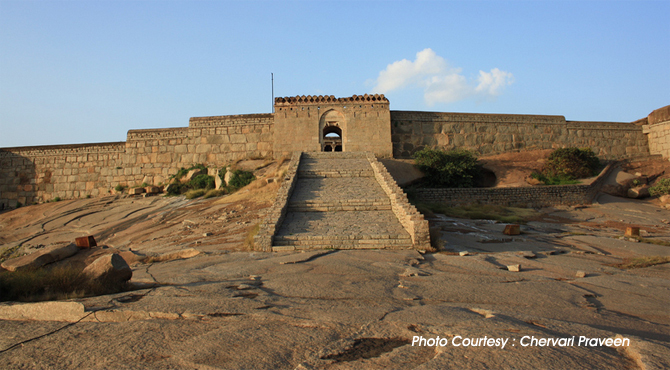 It is a magnificent fort encompassing the Fort Hill or Bellary Gudda, built during the period of Vijaynagara Empire. It is located in the heart of Bellary City with more than 2 km in circumference. The fort is one of the oldest historic sites in the State. The spectacular green hill top sceneries is the attraction of the Bellary fort. Constructed by Hande Hanumappa Nayaka, the fort was built on an isolated monolithic rock. In 1769 Hyder Ali captured the fort and renovated and modified with the help of a French engineer. Close to the eastern half of the mount, Hyder Ali added the lower fort. Hyder Ali is said to have hanged the French engineer, because the engineer miscalculated its height, making it visible from a hill called Kumbara Gudda thereby giving away the command and secrecy of the fort. The French engineer's grave can still be found at the east gate of the fort but the natives consider it to be the grave of a Muslim saint. After, Hyder Ali, the fort was ruled by his son Tipu Sultan. Later, British made Bellary as their cantonment. There are two divisions of this fort, Upper (constructed by Nayak) and lower Fort (constructed by Ali) symbolizing the two rulers. The upper fort's shape is polygonal which has a single entrance which can be reached through a rocky, winding path over boulders. This fort consists of a citadel, cisterns, temple, several pools and cells. There was a seven-color waterbody that has currently evaporated. The upper fort was to be used for ancient artillery. The tunnel here is also said to link the cities of Mysore and Sriragapatna. The lower fort lies in the eastern base of the rock. The fort is accessible from two gates from the western and eastern sides respectively. The fort once had armory and garrisons. The British added including stores, a Masonic lodge, a post office, a Protestant church, an orphanage and private homes in this fort. Currently, this fort houses numerous government offices, churches, educational institutions and other buildings. A temple of Lord Hanuman, named the Kote Anjaneya Temple is located just outside the eastern gate. This attractive fort is illuminated during Sundays and on state and national festivals.